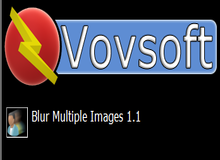 L'offre gratuite du jour pour Blur Multiple Images 1.1 était valable le 1 mai 2018! La plupart des éditeurs d'images vous permettent d'appliquer différents types d'effets de flou aux images, mais le processus n'est pas toujours aussi simple que souhaité par de nombreux utilisateurs, et la modification de plusieurs fichiers peut prendre beaucoup de temps. Blur Multiple Images est une application très simple qui cherche à offrir une solution plus accessible. Il vous permet d'appliquer un effet de flou en quelques étapes simples. Blur Multiple Images rend la tâche d'importation et de flou des images aussi simple que possible. Une fois que vous avez ajouté un ou plusieurs fichiers, vous pouvez afficher la liste dans la fenêtre principale et supprimer tous les éléments qui ont été importés par accident. Really not sure why most of us would need this - unblurring I can see a use for but not blurring. The website is no use whatsoever being very basic with no explanation or examples. Sorry, I'll pass on this one. If it allowed blurring of part of the image leaving the rest sharp... maybe some use but how could this be achieved on multiple images? Not enough info in the blurb to say whether it can or can't but my bet is that it can't in which case it would seem to be next to useless. I'm not going to waste time downloading and testing to find out something that should have been stated at the outset. If it allowed blurring of part of the image leaving the rest sharp... maybe some use but how could this be achieved on multiple images? Not enough info in the blurb to say whether it can or can't but my bet is that it can't in which case it would seem to be next to useless. I'm not going to waste time downloading and testing to find out something that should have been stated at the outset. Why would you want to blue multiple images? My last thought first: For ME, a total waste of time to download, install and test. For most, I would think this type of application would have very limited use, such as creating background layers for text display, etc. - which is where MY interest was with this offering. And that, of course, assumes the software would, at least, accomplish it's intended task. For me, it did NOT. Installation and registration was a breeze on my Win 7 Pro system. That's about the only positive thing I can say about "Blur Multiple Images v1.1"
2 - Once you have selected your images and clicked the "Begin Blur" button, there is NO indication of anything happening. i.e. a status or progress bar of some sorts. You're left wondering if the program is actually running or perhaps has frozen. (which it DID freeze during one of my tests - not sure why as it only happened once and I coukd not repeat the problem) You do get an "Operation Complete" message when all of the selected images have been processed. 3 - There are NO parameters that can be changed or customized such as blur intensity or the addition of any type of filter to the original image. 5 - Once you have selected a group of images, there is no way to (intutitively) clear or delete them from the Image Files" window. Your keyboard Delete key doesn't even work. You have to close and restart the program OR Shift-select all images then Right-click on the highlighted files then choose Delete from the drop-down menu. The bottom line? In my opinion, A small, very easy to install and register application that is totally useless. Installed then Uninstalled using Revo Uninstaller Pro. My last thought first: For ME, a total waste of time to download, install and test. For most, I would think this type of application would have very limited use, such as creating background layers for text display, etc. - which is where MY interest was with this offering. And that, of course, assumes the software would, at least, accomplish it's intended task. For me, it did NOT. Installation and registration was a breeze on my Win 7 Pro system. That's about the only positive thing I can say about "Blur Multiple Images v1.1" Here are my negatives: 1 - The selected images were only SLIGHTLY blurred, at best. Tried to blur the (same) so-called blurred images by running through the program again. Multiple passes resulted in only minor additional blurring. Waste of time. (For me anyway) 2 - Once you have selected your images and clicked the "Begin Blur" button, there is NO indication of anything happening. i.e. a status or progress bar of some sorts. You're left wondering if the program is actually running or perhaps has frozen. (which it DID freeze during one of my tests - not sure why as it only happened once and I coukd not repeat the problem) You do get an "Operation Complete" message when all of the selected images have been processed. 3 - There are NO parameters that can be changed or customized such as blur intensity or the addition of any type of filter to the original image. 4 - There is NO way to change WHERE the newly created "blurred image" can be stored - by default it goes back into the same folder as the original image. (at least the filename is changed to protect the original image from being overwritten) 5 - Once you have selected a group of images, there is no way to (intutitively) clear or delete them from the Image Files" window. Your keyboard Delete key doesn't even work. You have to close and restart the program OR Shift-select all images then Right-click on the highlighted files then choose Delete from the drop-down menu. The bottom line? In my opinion, A small, very easy to install and register application that is totally useless. Installed then Uninstalled using Revo Uninstaller Pro.